We'll drive to Taksim Square area and walk approx. 2 kms down Istiklal Avenue, along local shops, shopping centers, banks, restaurants, bars..etc. We can stop and spend time anywhere you like. * Taksim is situated in the European part of Istanbul and, is a major shopping, tourist and leisure district famed for its restaurants, shops and hotels. It is regarded as the heart of modern Istanbul, with the central station of the Istanbul Metro network being located here. Taksim Square is also the location of the Cumhuriyet Aniti (Monument of the Republic) which was crafted by the famous Italian sculptor Pietro Canonica and inaugurated in 1928. The monument commemorates the formation of the Republic of Turkey in 1923, following the Turkish War of Independence. * Galata Tower has dominated Beyoglu's skyline since 1348 and still offers the best panoramic views of the city. Originally named the Tower of Christ, it was the highpoint in the city walls of the Genoese colony called Galata. Most of the walls are long gone, but the great tower remains. Until the 1960s it was a fire lookout tower. Now the upper floors hold a restaurant and a panorama balcony. * Jewish Museum Housed in the ornate 19th-century Zullfaris synagogue near the Galata Bridge, this museum was established in 2001 to commemorate the 500th anniversary of the arrival of the Sephardic Jews in the Ottoman Empire. Its modest but extremely well-intentioned collection comprises photographs, papers and objects that document the mostly harmonious coexistence between Jews and the Muslim majority in this country. We have lunch on Istiklal Street at a tradational restaurant, then we visit the Neve Shalom Synagogue. 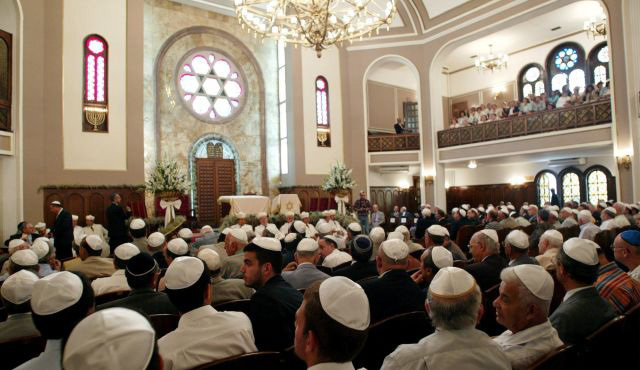 * Neve Shalom Synagogue, called the "Oasis of Peace" or the "Valley of Peace," the Neve Shalom Synagogue is located on Büyük Hendek Street in the Galata Kuledibi district of Istanbul. Marsel Franko, a Jewish community leader, renovated the gym of the “First Coeducational Jewish School” to be used as a synagogue. It was opened during Rosh Hashanah (Jewish New Year) on September 26, 1938. In 1949, all the necessary legal permissions were obtained, and the project’s development began. Among all the projects prepared for the synagogue’s construction, those of Elio Ventura and Bernard Motola, who had recently graduated from Istanbul Technical University, were accepted and the building was open for religious services on March 25, 1951. 1671 - There is evidence that a synagogue existed in this place already in 1671. 1823 (25 Safer 1239) - The actual building was re-erected over its original foundations in the early 19th century. The synagogue named Kal Kadosh Galata is better known as Zulfaris which is a distortion from Zülf-ü Arus, former name of the street, meaning bride's long lock of hair. 1882 - The marble frame surrounding the Ehal (Ark) was donated by Samuel Malki. 1890 - Repair work was carried out with the financial assistance of the Camondo Family. 1904 (Nisan 5664) - Restoration work was conducted by the Jewish Community of Galata presided over by Jak Bey de Leon. 1968 - Went through substantial repair. 1979 - Assigned for worship for the Jews of Thracian origin. 1983 - Last wedding in Zülfaris Sinagogue. 1985 - Closed to religious services as there was no more jews residing in the neighborhood. 1992 - The building was assigned (by its owner, Neve Shalom Foundation) to the 500. Yil Vakfi on the purpose to establish a museum. 2001 - With the financial backing of the Kamhi Family and the valuable contributions of Mr. Jak Kamhi and thanks to the vision and dedication of Mr. Naim Güleryüz, it has opened its doors as a Museum. After visiting these sights we will take you back to the hotel. Sisli (SHEESH-lee) is a prosperous residential and commercial district 2-1/2 km north of Taksim Square. Two Jewish interest sites,the Sisli Beth Israel Synagogue and the Italian Jewish Cemetery are worth visiting here.. In the nineteenth century,many wealthy Istanbul families had summer houses in Ortakoy ( OHR-tah-keuy ) then a Bosphorus village. Today Ortakoy has become part of the Istanbul metropolis and is a fashionable place to live winter or summer. Though the Jewish orphanage here is gone and the Historic ETZ Ahayim Synagogue building burnt in 1941 and there is stilla synagogue here and many order historic Ottoman sites in the vicinity. Some historians say the Princes' Islands ,a half hour's voyage southeast of Istanbul in the Sea of Marmara were named for their use as a place of exile for wayward or inconvinent Byzantine princes. In Turkish they are simply called Adalar ( ah-dal-LAHR).